Top voting issues: Supreme Court, health care, economy. With less than six weeks to go before the elections for Congress, voter enthusiasm is at its highest level during any midterm in more than two decades. And a record share of registered voters – 72% – say the issue of which party controls Congress will be a factor in their vote. Opinions about Donald Trump also continue to be an important consideration for voters. A 60% majority views their midterm vote as an expression of opposition or support toward Trump – with far more saying their midterm vote will be “against” Trump (37%) than “for” him (23%). The new national survey by Pew Research Center, conducted among 1,754 adults, including 1,439 registered voters, finds that the Democrats have several advantages at this point in the campaign. First, Democrats hold a 10-percentage point lead over the Republicans in the generic ballot. About half of registered voters (52%) say if the election were today, they would vote for the Democrat in their district or lean toward the Democratic candidate; 42% say they would support the Republican or lean Republican. In June, the Democrats’ lead in the generic ballot was five percentage points (48% Democratic, 43% Republican). Second, while voter enthusiasm is relatively high among voters in both parties, it is somewhat higher among voters who favor the Democratic over the Republican candidate. Overall, 61% of all registered voters say they are more enthusiastic about voting than in past congressional elections, higher than at any point during midterms in the past two decades, including at later points in those elections. Two-thirds of Democratic voters (67%) say they are more enthusiastic than usual about voting, compared with 59% of Republican voters. 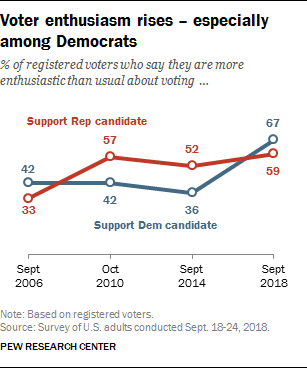 The share of Democratic voters who express greater enthusiasm about voting is substantially higher than at comparable points in three prior midterms, while enthusiasm among GOP voters is slightly higher than in September 2014 (52%) and about the same level as in October 2010 (57%). Third, more Americans view the Democratic Party than the Republican Party as more concerned with people’s needs, more honest and ethical and more willing to work with leaders from the other party.